UPDATED–Toughest parts of a bass fishing interview are asking the right questions–and then being able to read my notes so I can tell the story. 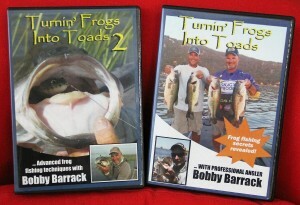 Bobby Barrack’s companion videos “Turnin’ Frogs into Toads” (1 & 2) has taken a double, make that, a triple load off my back. For the first step, Bobby clearly thought about what information he should share–what would be essential and make sense. Second, if you get these videos, you won’t have to read my notes–nor will I. And third, because the information is so comprehensive (plus, you gotta like frog blow-ups and frog misses on screen) I won’t have to relate all he and Capt. Nathan Chandler have packaged for you. But let me share some other feelings on the matter. I don’t like fishing videos–especially where the guys smash them for 30 minutes–and laugh like you’re an idiot for not catching the same fish on your local water. That’s not what you are going to get. Right up front, Barrack confesses he pulled some of his footage from 10,000 hours of video. I personally have 8 hours a year of frog fishing, for the last three years–with little shot at a real toad bass. No wonder, my learning curve ain’t that steep. But while these two vids are replete with a requisite number of frog maulings, the stuff you really need to get more proficient is all here. Things to consider such as types of cover, bass attack angles, the need for color variations, the realities of strikes and misses, essential bait modification, and even the answer to the the much argued question: When do I swing? Oh, and probably a hundred or so other things. But what I really appreciated were the appropriate live examples–both of what to do and what not to. Gutsy. Anyway, watching these tutorials I felt like I was back in college, taking notes like scared freshman. But knowing I can go back to “the open book,” actually getting both videos as a package deal for $29.99 (instead of $19.50 for one) is pretty stout. It’s just one click to the Snagproof.com store. Now Bobby really needs to worry about my learning curve. A couple of months from now and maybe I’ll be posting frog videos! This entry was posted on Monday, February 29th, 2016 at 4:13 pm	and is filed under News, Reviews. You can follow any responses to this entry through the RSS 2.0 feed. You can leave a response, or trackback from your own site.